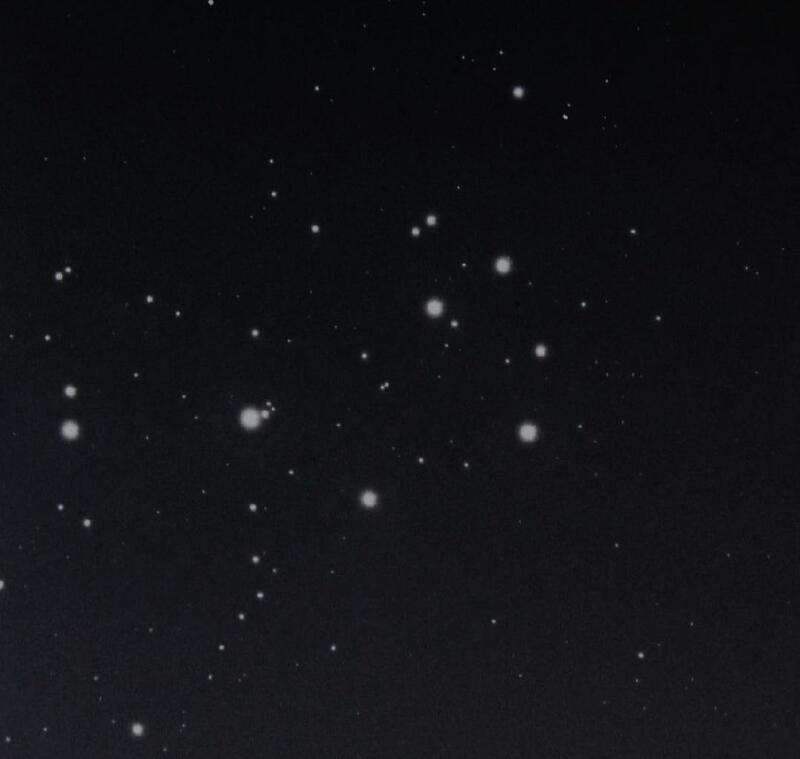 Yes, I know that looks like the moon - but our local neighborhood rock shares the stage with the Pleiades (M45), in Taurus. 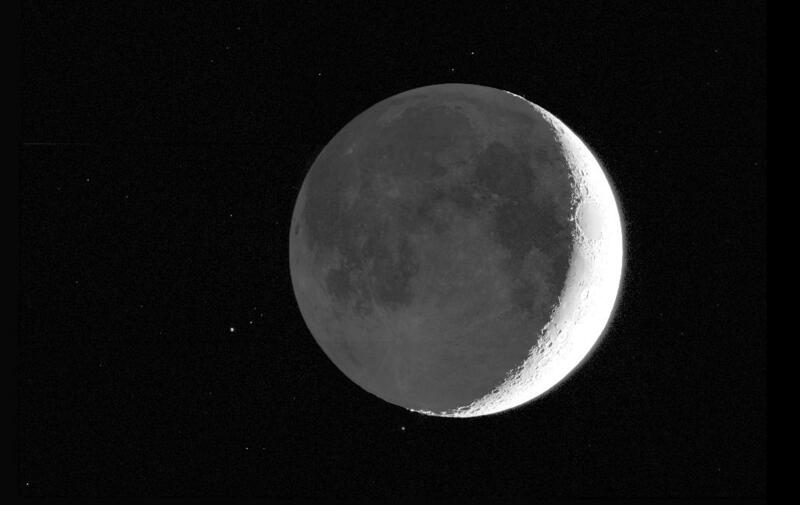 This image is from a set of 12 CCD exposures taken during the occultation of April 1, 2006, with the 0.4-meter telescope of the University of Alabama Observatory. This product took enough processing to make it the last object to take its place in my Messier gallery. The ideal was to yield an image which would show at once detail in the sunlit crescent, the Earthlit part of the Moon, and the background stars. To do this, I have reduced the brightness of the crescent and used a logarithmic intensity scale in overall brightness. 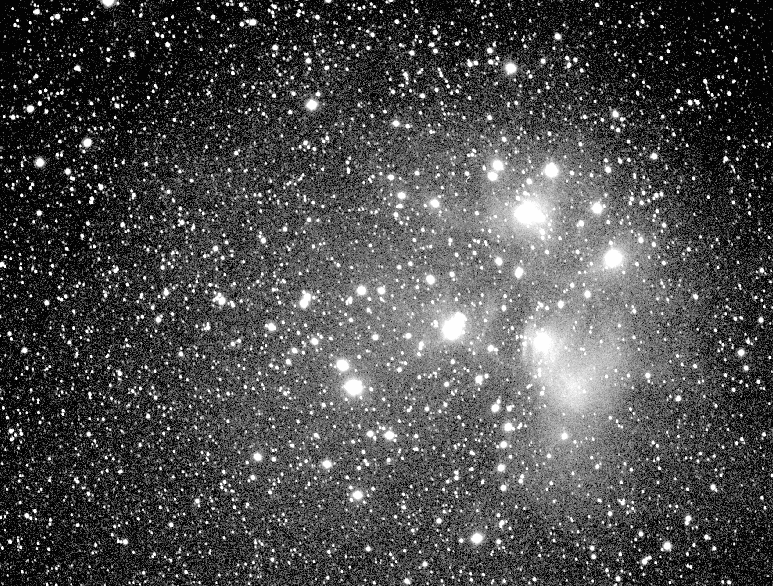 To see the star cluster unobscured by that rock (here's that psychological obsession with backlighting again...), I'll show an image made from a plate taken by Steve Odewahn over 20 years ago with the 10-inch refractor formerly housed in the UA Observatory. This was part of some experiments with densitometry. The reflection nebula associated with the cluster (from Doppler shifts, the cluster is only passing through the dust) shows up gratifyingly well in this red-light exposure with the University of Alabama Crimson-Dragon wide-field system, used on top of the campus physics building. I look forward to what it shows when it can be used with a blue filter from a dark site.